We had planned to do this one a couple weeks ago but the weather was bad. This weekend however delivered perfect climbing conditions so we trekked south for a Mt Adams climb. Leaving Seattle on a Friday is a loosing prospect to begin with. Then there is the location of the mountain itself. 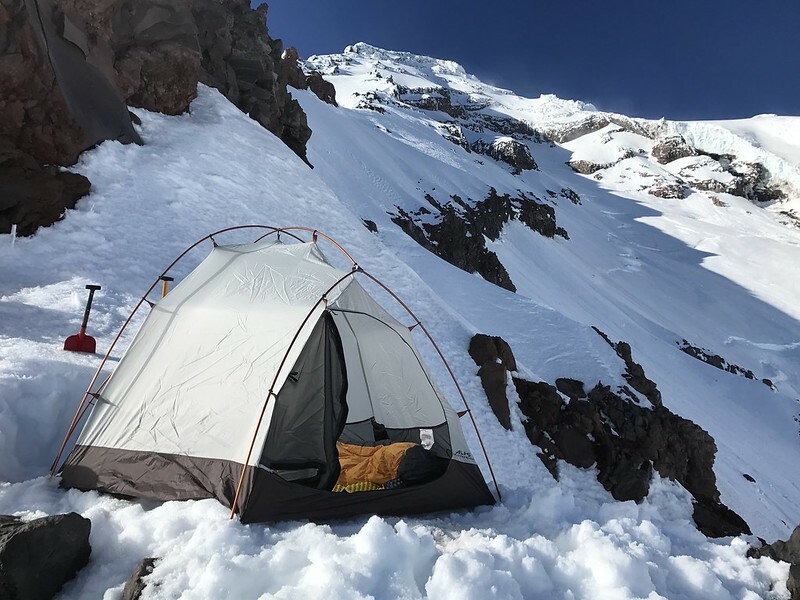 It is said that Glacier Peak is the most remote volcano in Washington, but I think I would rather do a few extra hours hiking, than the five hours in the car it took to get to the town of Trout Lake. All the same, we camped out on Friday night which made for a relaxing morning on Saturday where we slept in, made breakfast, checked in at the ranger station and drove up to Cold Springs where we started out from the trail head by 11:30pm. We stopped for lunch at 7000 ft where the snow finally became skinnable. By 2:00 pm we were moving again, making it to Lunch Counter camp by 4:00 pm which allowed for casual evening. The next morning we were up a little after 5:00 am and on the move by 6:30 am. We topped out by 11:00 am, rode the south ridge down and were back at camp by noon. It was a gorgeous sunny June day and we enjoyed every minute of the climb crowd negotiation included. We were back to the car by 3:oo pm. The snow was soft but sun cupped and made a choppy ride down at certain points but warmed significantly from the day before. None the less it was good to check another Washington volcano of the list. Tagged touring, Volcano, Mt Adams. We’re standing on the top of Oregon’s tallest volcano which by itself isn’t that impressive considering over 10,000 people attempt the summit every year but our path was windy one and for awhile the whole thing seemed unlikley so for now we are just happy to be here. The Cooper Spur route on Mt Hood doesn’t get traveled nearly as much as its cousin route to the south. The steepness of the route combined with its relative inaccessibility early in the season while Cloud Cap road is still closed, increase both the physical and technical factors. 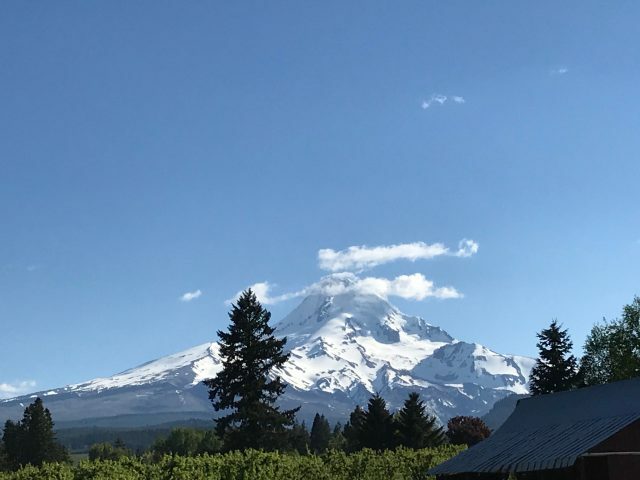 If you’re coming from Hood River the route follows the skyline up the left side of the mountain in what is obviously a desirable ski. We drove down from Seattle on Friday afternoon, stopped for dinner and started hiking by 11:15pm that night. We we’re concerned about rock fall up through the chimney at the top so we wanted to summit early before things started heating up. The road is currently closed at the Tilly Jane Sno Park so that added an extra 3.5 miles and 1500ft to the day. Climbed up to 8200ft by 230am and we encountered 40mph winds and low visibility so we bivied to wait for the sun to come up. It was very cold. At 6am we moved camp up to the bottom of the “climb” at 9k despite continued poor viz. At 830am we decided to bail on the summit because we didn’t feel comfortable snowboarding a route that we couldn’t see. We had dropped about 500ft when suddenly everything blew off and the weather cleared. At this point we decided to go for the summit after all so we turned back around and finished the climb. The final 2200 is a fairly sustained 50 degree pitch that requires front pointing with two tools. I only had one, so things were slower for me. The objective hazard from rock fall was mitigated by the wind keeping things cool. We opted to not rope up as an unarrested fall would have been potentially fatal for the whole team due to the exposure below. We summited around 130pm riding the line down that we climbed. It hadn’t really softened so the top 2000 ft was fairly icy. It made for a pretty gripping descent. The corn skiing was decent between 9200 and 7500ft and mush after that. We got back to the car by 4pm. It was a 17 hour day with about 11 hours actually moving. A very aesthetic natural line on the mountain with nice exposure and great climbing in that last 2k feet. It wasn’t the basic route to the summit and it wasn’t our typical climb but the results were great all the same. Having both been recently unencumbered by employment, Rory and I made plans for a weekday tour. Monday’s forecast was for Sunshine and temperatures approaching 60F, so we brainstormed higher mileage tours that would avoid south facing, large and/or steep terrain in the afternoon. The prior weekend was unseasonably warm as well, so we figured any good snow would be hidden on north aspects. 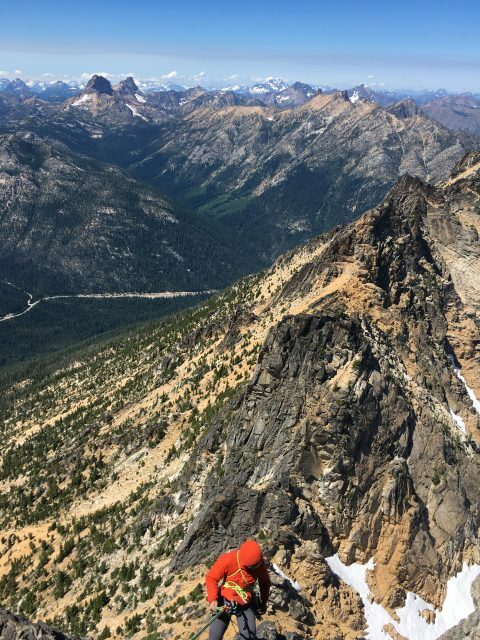 We settled on a loop in the Aplental backcountry with descents down a north aspect of Chair Peak and Holy Diver on the way out, and descents from Gem Lake and Snow Lake on the way back. For this route the larger more avalanche prone descents down Chair and Holy Diver are north facing and accomplished early in the day, before snow would be expected to be sliding around. 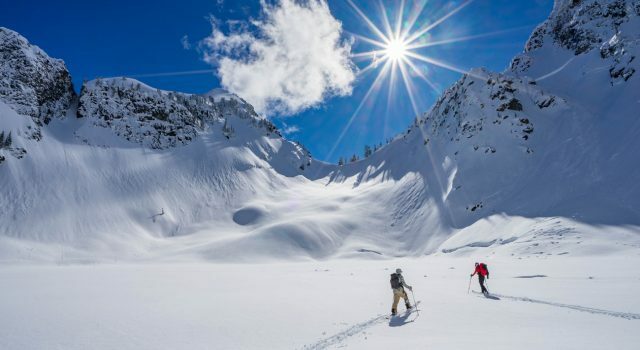 The route’s descents down from Gem and Snow Lakes are south facing and skied in the heat of the afternoon, but the terrain here is smaller and more manageable. The ascents on this tour are favorable for a warm day as well – The south aspect ascents up Chair Peak and Mt. Roosevelt are accomplished early in the day, leaving shaded north facing ascents to Gem Lake and Snow Lake Divide for the afternoon. We hit the trail at 7:30 AM, just between dawn and sunrise. Conditions for the tour up were hard pack, as to be expected with Sunday’s warm weather and refreezing overnight. Travel got a little friendlier as the sun began to warm the snow/ice surface while ascending Snow Lake divide. (L) Descent to snow lake from North Face of Chair Peak. (R) Rory scoping descent from midway bench. The snow for our descent from Chair to Snow Lake was a bit firm and wind affected, however, the north aspect’s cooler temps and shade left a chalky edgeable surface with fresh snow scattered about. Fun turns overall. The ascent from Snow Lake to Holy Diver was steep, sunny and beginning to get warm. We topped out at 11AM and would have been in a tough spot any later in the day. Holy Diver held similar snow conditions to the north aspect of Chair Peak. Rory and I are typically snowboarders, but due to the mileage, amount of transitions and expected snow conditions, we opted to goon around on skis for the day. 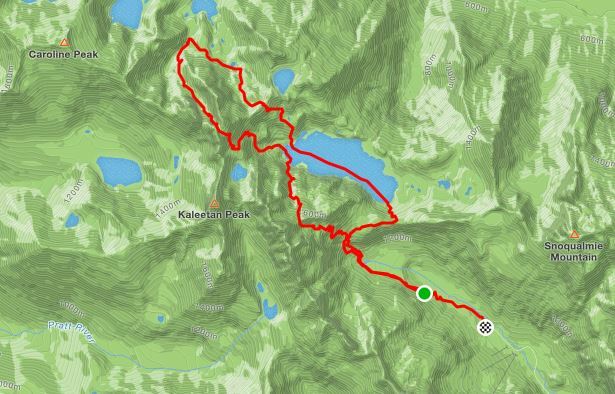 After dropping holy diver we looped around towards lower wildcat lake and transitioned for our ascent and return southward through Gem and Snow Lakes. We experienced a bit of loose wet activity on the afternoon’s south facing descents from Gem and Snow Lakes, but nothing unexpected or unmanageable. We also noticed a small slide took out a corner of our uptrack to Holy Diver later in the day as things warmed, reinforcing our decision to tackle that bit early. The bottom of Bryant Col. slid pretty big down to source lake as well. Fantastic sunny day in the mountains, fist pumps and high fives all around. 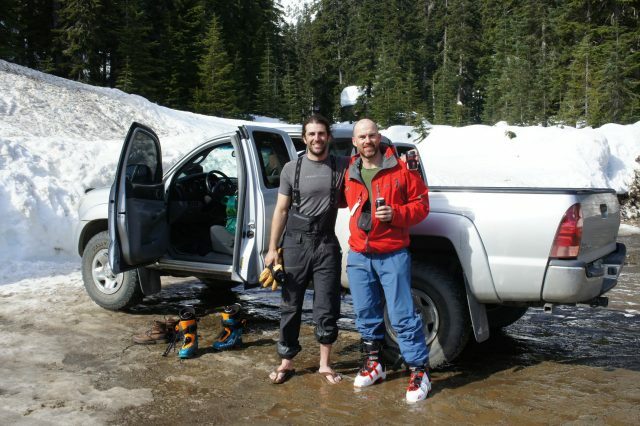 We went out in Alpental Valley on Saturday. For me, it was my first time out there on a splitboard. Our objective was to Circumnavigate Chair Peak. We left from the upper parking lot at 8am and split up into the valley following the groomed track until it ended. At this point split left until we met up with the main skin track just below Source Lake. The East Shoulder of Chair Peak was pretty crowded with groups skiing off every aspect, by the time we got up there around 10am. We dropped the north side down to Snow Lake making the best turns of the day. The trail out the west side of the lake was set for us up to 4400ft where we bumped off of it passing the guys who had set it as they bailed off of Holy Diver due to warming conditions. After that we were on our own, breaking trail up to Melakwa Pass and then down the other side completing 3/4 of the pizza that is Chair Peak. 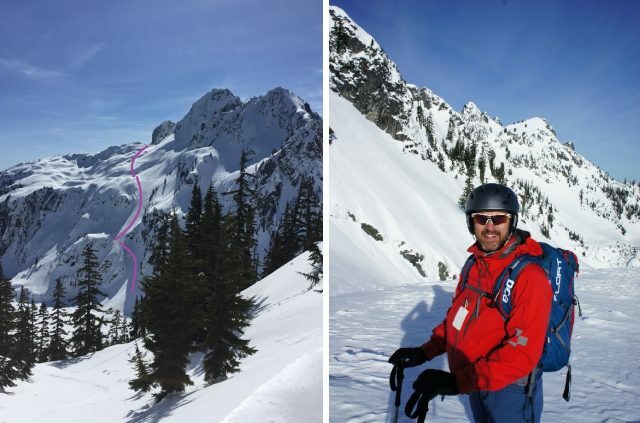 Finally the last sprint up to the top of Bryant Peak Couloir where we could look back down into Alpental Valley and at our last descent. The run back to the car could be made by the determined one footed snowboarder without a transition. Warming temperatures couple with storm and snow and wind activity in the previous days caused a lot of loose wet slides on just about everywhere the sun hit. Early in the week some pretty big slides released leaving crowns upwards of 5ft on North East aspects and significant debris on our descents into Snow and Source Lakes. 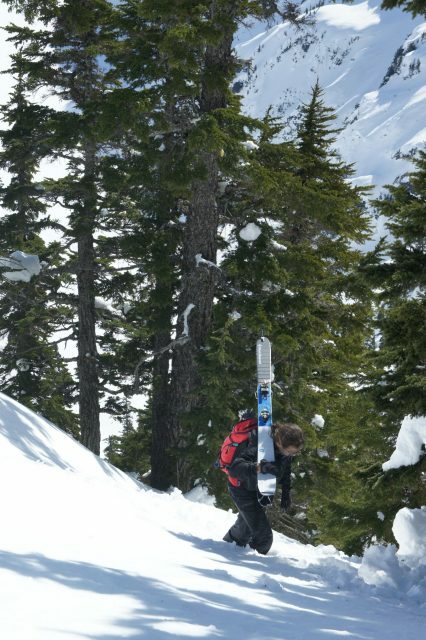 Tagged splitboarding, Chair Peak, Alpental, Snoqualmie Pss. I booked three nights at the Asulkan Hut after the third separate conversation when it came up last year. The hut was built in 1995 so who knows why it took so long to get on my radar but I guess I’m still relatively new to British Columbia huts so away we go, to Rogers Pass. The long term forecast had looked nice for the weekend of our trip. A couple feet of new snow and clearing weather for the holiday weekend, but that changed as temperatures started to warm straining several already anxious persistent weak layers from earlier in the season. 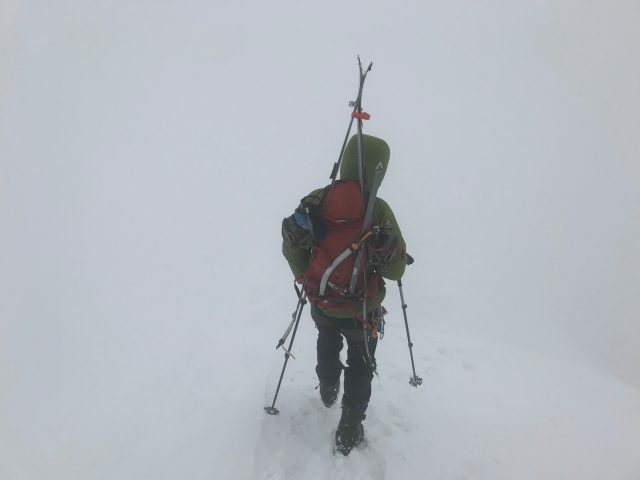 As we split out into the valley on Friday we passed the last two of our hut compatriots just as they were turning around unwilling to risk a weekend at the hut in unstable conditions. They mentioned that the other four folks who had also booked the hut had already bailed so just like that we had one of Canada’s best huts to ourselves. We arrived at the hut a little before 2pm, about four and half hours after we had left the car. The sun wasn’t coming up fully until 8am and it was starting to set by just after 3pm so we called it early and saved it for Saturday. On Saturday the avalanche danger was not only high, but there was a special bulletin out discouraging backcountry travel in the region. With this in mind we stuck to lower angle runs below the hut like the tree triangle and the moraine. We triggered one slide remotely, probably about 300 meters across, going up for the last run of the day but kept it pretty safe. More warming on Sunday and we decided to pack up and head out a day early. The temps were predicted to spike just above freezing resulting is a significant shedding cycle that we didn’t really need to mess with. We drove back to Seattle that night and promptly booked 3 more nights at the Asulkan hut for next year. Tagged splitboarding, Asulkan Hut, Canada, Revelstoke. Just a quick update on early season conditions so far. We went out in Silver Basin at Crystal on Saturday. There were probably about 50 cars in the parking lot when we arrived a little after 9am. It was wanting to snow so badly while we geared up but it was coming down mostly as mixed precip. Our group of 10 split up the Quicksilver chair line more or less in some very heavy snow that didn’t really soften until we entered the basin proper at 5600 ft. From there we followed the skin track of 5-10 other groups who were already out there attacking Three Way Peak, the King and everything in between. We took about three runs and several core shots before we turned around at 2pm and rode back to the parking lot. Good snow up high, still a little wet, but that will help to cover some of the sharks that are still lurking up there. More snow this week. Fingers crossed for an early opening. Tagged Mt. 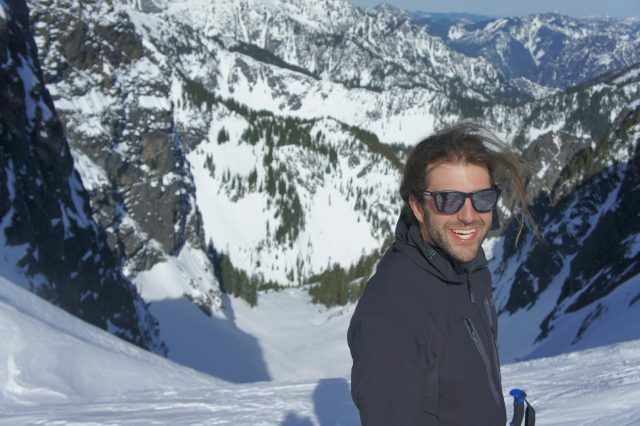 Rainier, Crystal Mountain, Silver Basin, South Cascades. 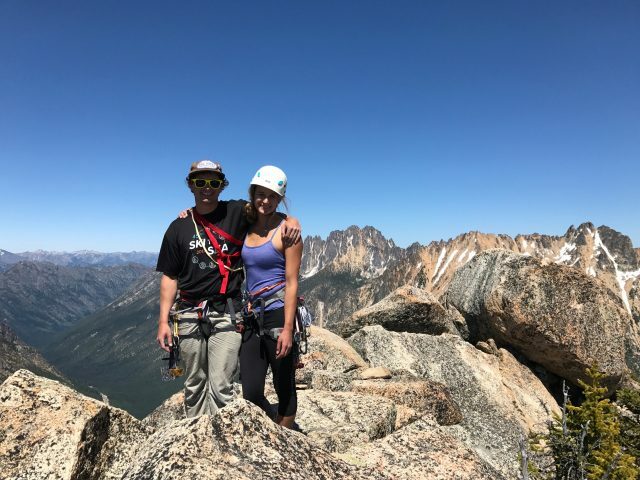 This year Tim and I decided we wanted to learn the true meaning of Labor Day so while we could have spent our three day weekend climbing anywhere we chose the Pickets, a range in the North Cascades known by climbers for its remoteness and inaccessibility. In 1931 when all of the major peaks in the Tetons had established routes the Pickets saw their first recorded technical ascent. 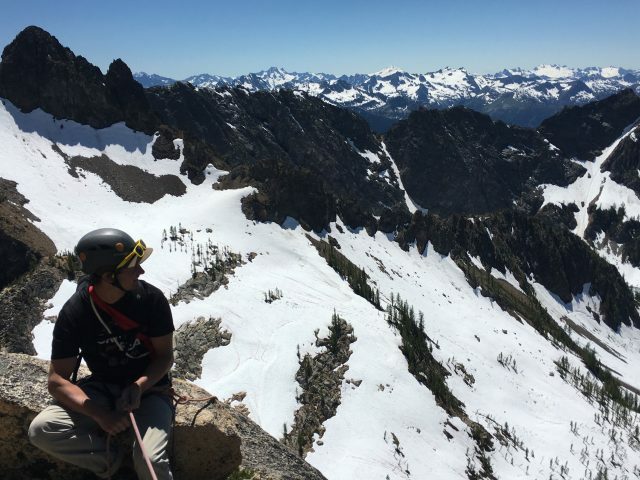 When people talk about the wild of the North Cascades they are talking about the Pickets. So we decided on the east ridge of Inspiration Peak, a route first climbed by Becky and company in 1958. We started from Upper Goodell Creek Campground at 10am on Saturday morning. The first 4 miles follows an overgrown road bed along the east side of the creek until it abruptly ends, signaled by a cairn and turns uphill. From there it was an unrelenting 5000 ft charge uphill on what is generously called a climbers trail. But even that doesn’t tell the full story, in a place where an approach is better measured in time rather than distance. 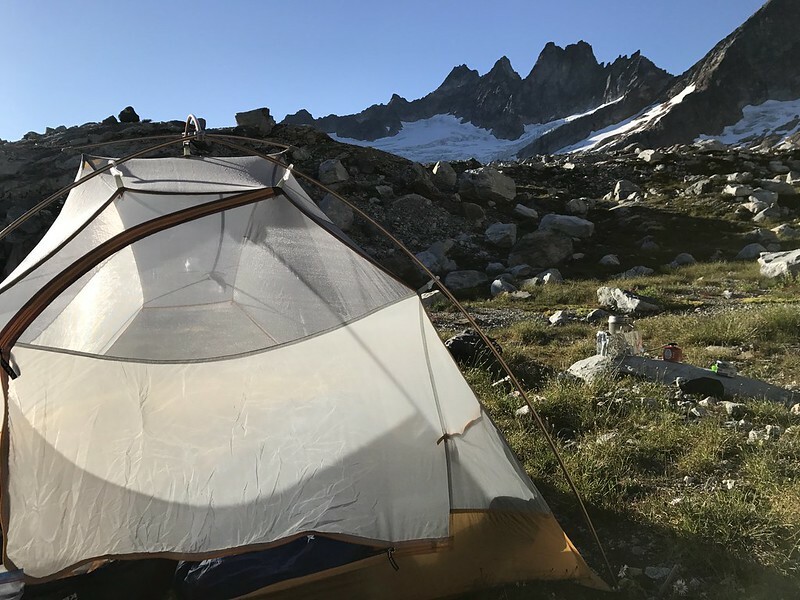 And 8 hours later we made camp following a well traveled trail into a gravel basin at 6000 ft with a meadow at the bottom and plenty of water to make up for the lack of it on the approach. Big views of terror basin the the southern Pickets took some of the hurt off from the approach and reset our motivation. When we hit the glacier we roped up for some fairly straight forward glacier travel up until our final crevasse crossing. We navigated it by down climbing off of a snow bridge onto a lower ledge and climbing out. And then we stood at the bottom of the route, 7,400 ft above the ocean, four hours after we had started. 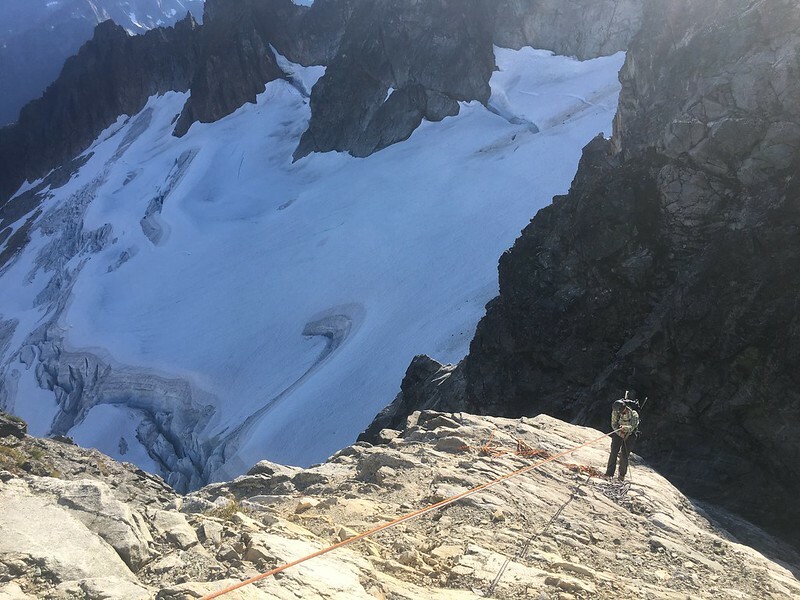 We simul-climbed the first “two” pitches following a series of gullies and ledges trending toward a notch between the east ridge and a small spire to its right. The climbing gradually turns into a blocky face that we broke out into two 5.7 pitches as we worked our way onto the east ridge. The next two pitches are the ones we came all the way out here for. 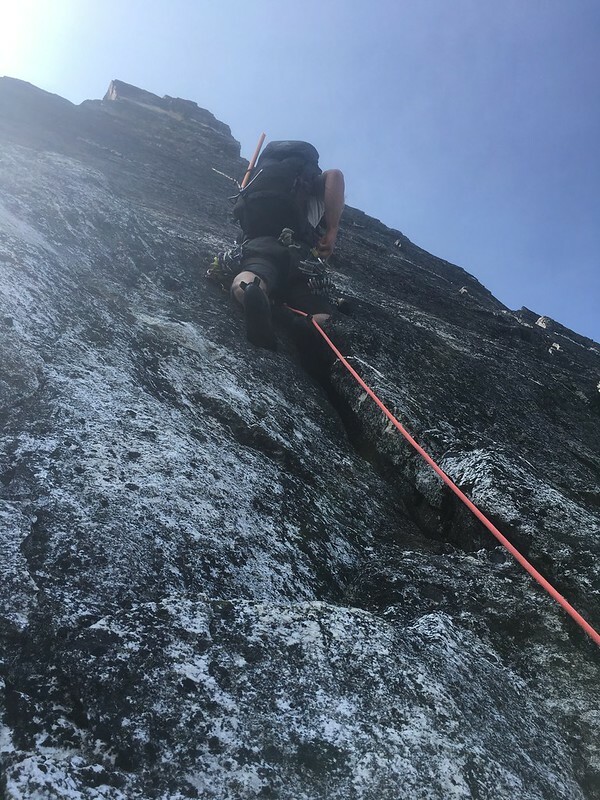 The layback pitch starts exactly how it sounds climbing right around the roof and then straight up to a roomy belay at the bottom of a splitter hand crack. The crack climbs straight up and offers the occasional face hold but mostly excellent hand and foot jamming. At the top we cut out right aiming at the notch in the rock around the roof and then up and left to a belay. Now through the crux we simuled the last “three” pitches to help ease the rope drag on a wandering climb across the top. From above the hand crack drop on to the north side and then up and left and around the south side of the east summit. We crossed the ridge down climbing to the base of the True summit and then and easy low fifth class scramble all the way up checking in at the top at 4pm. Now the good part. 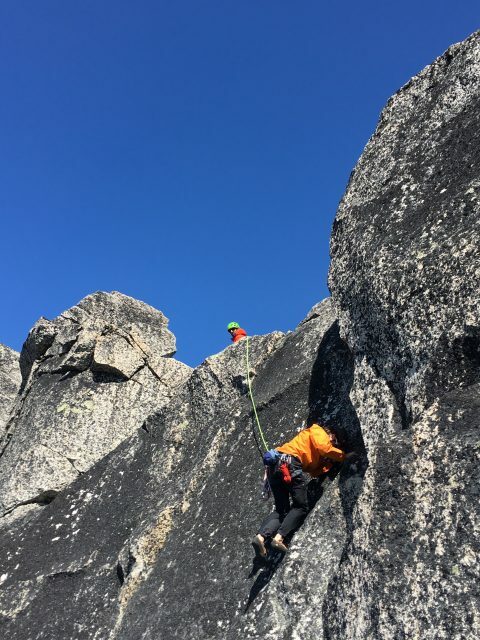 Three double length rappels down the West Ridge. Raps are easy to find. Three more double length rappels down the gully. Lots of loose rock with very little protection offered from above. This took us 3 hours. Then we were standing at the upper glacier trying to figure how to cross a massive moat to get up on top of the snow. As it was, we climbed down underneath the glacier through a tunnel and popped out on a ledge in a crevasse. It was dusk now and we were loosing light, so with no great option to get out we front pointed straight up and out which was a less desirable approach with a lot of exposure to what lay below but ultimately better than turning around and finding another route out in the dark. The rest of the trek back was long and circuitous in the dark, but generally uninteresting. Back at camp at 11:30pm. We had stashed a couple beers in the creek that made the hike back slightly more bearable and made dinner slightly more enjoyable. Slept in on Monday but the smoke came in that night to punished us in the morning and then on out hike out. We made it back to the car in 6 hours. It doesn’t get much more Cascades than this. It may take awhile to forget the approach and head back into the heart of darkness that is the Pickets but we did well in honoring the holiday. Tagged Inspiration Peak, East Ridge, Traverse, The Pickets, North Cascades, Washington, Terror Basin. 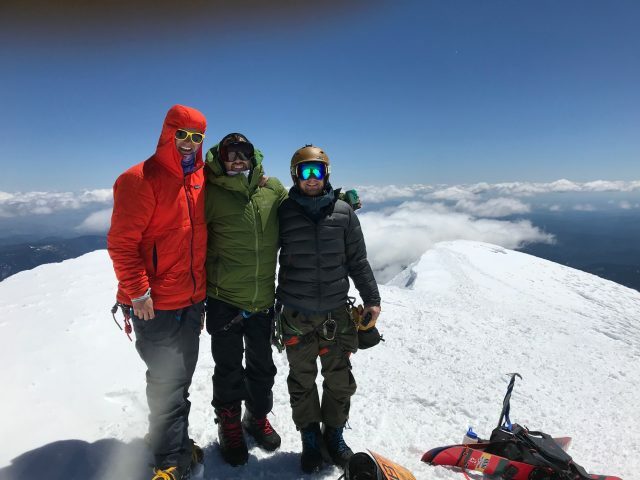 Tim and Andrew beat us to the same summit up the same route two days earlier, so David and I rolled into Monday with some helpful beta for the climb. In hopes of a warmer climb we opted for a later start, leaving from the trailhead at 7am. We followed the Blue Lake trail for 1.5mi, until the terrain opened up and we had views of the Liberty Bell group. From there we took the obvious climbers trail that branched left, headed up towards Concord tower. The trail dwindled, and we got off track trending too far left, getting almost to the base of Concord before cutting back right. A high traverse across snow brought us to the base of South Early Winters Spire. There were two parties ahead of us, so we waited at the high ponderosa hoping the sun would come over the ridge soon. When the route cleared, we scrambled climber’s left to rack up at the Y-shaped larch. Descent: Down the South Arête. At the top trend left to avoid dropping down the gully. There is a tight gently sloping chimney to descend, this awkward move is somewhat easier without a pack or rope on your back. 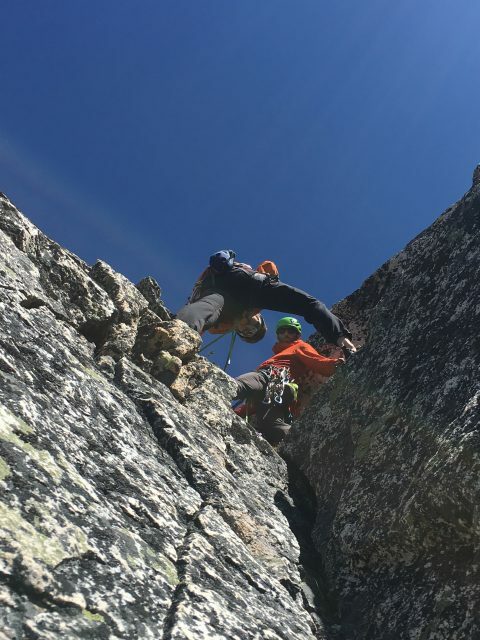 Continue down the arêtes to the first of three rappel stations. After these rappels you are at the base of South Arête, and can walk back to the base of the Southwest Rib. Success Glacier Couloir on Mount Rainier. A friend of a friend had heard about it. Finding information on the route wasn’t easy; a google search pulled up a couple dated trip reports with helpful beta but very little to cross-reference against. 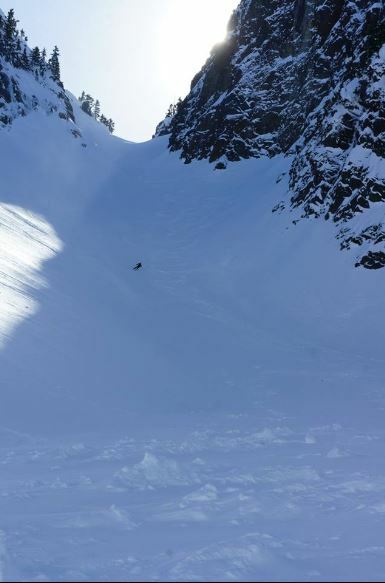 Skiing down the south-facing couloir seemed straight-forward (and fun!) but climbing up was more like choose your own adventure. 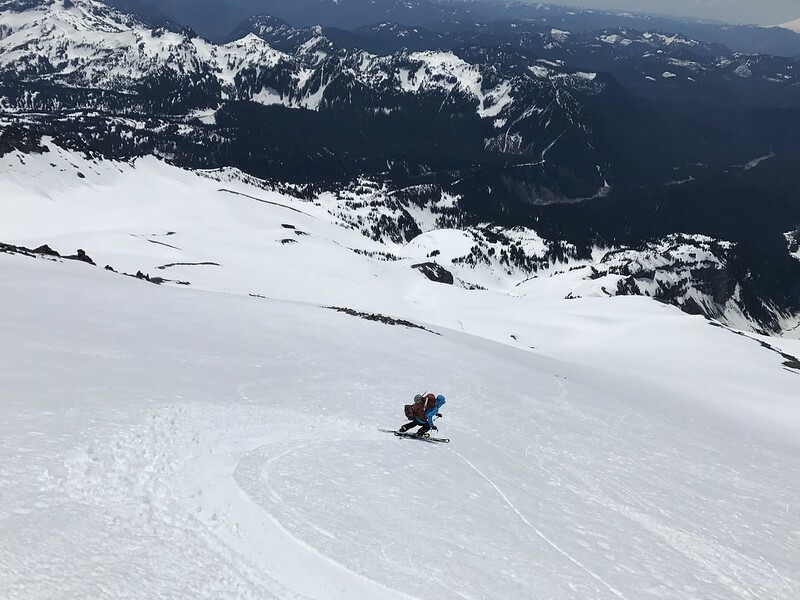 We chose the Kautz Cleaver for the ascent with two goals in mind: 1) ski the couloir, and 2) summit rainier via a traverse onto the Kautz Headwall. We (David, Sam, myself) started Saturday morning from Paradise at 9:30 AM. 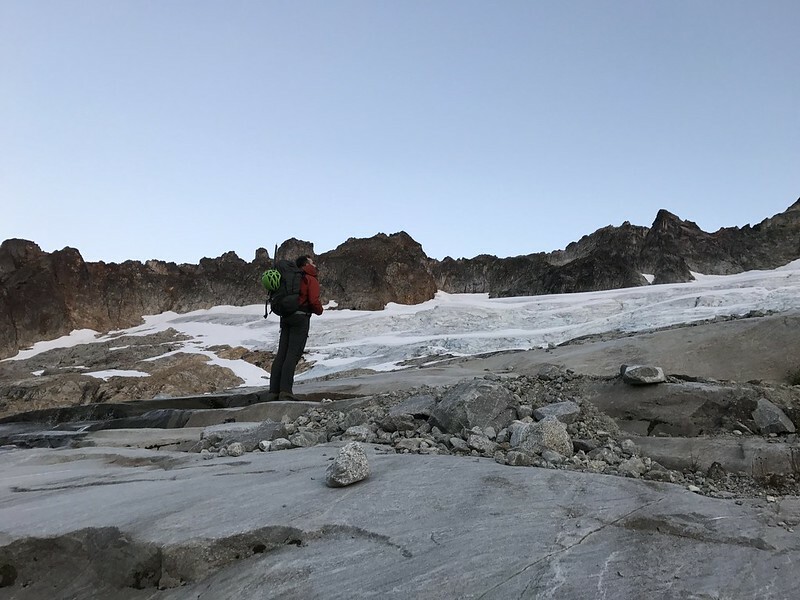 Day One was largely a traverse taking us across the Nisqually, Wilson, Van Trump, and Kautz Glaciers. 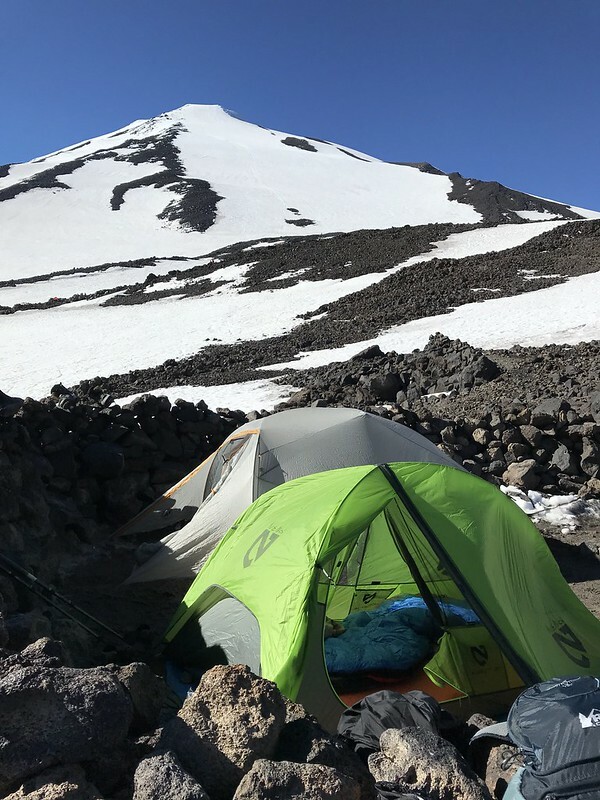 The route steepened when we got to the cleaver (35 to 45 degrees) and we ascended to 10,200 feet before taking up camp at a lovely bivy spot. For some reason this route just isn’t popular with the rainier masses, so we had the entire cleaver to ourselves Saturday. Party! 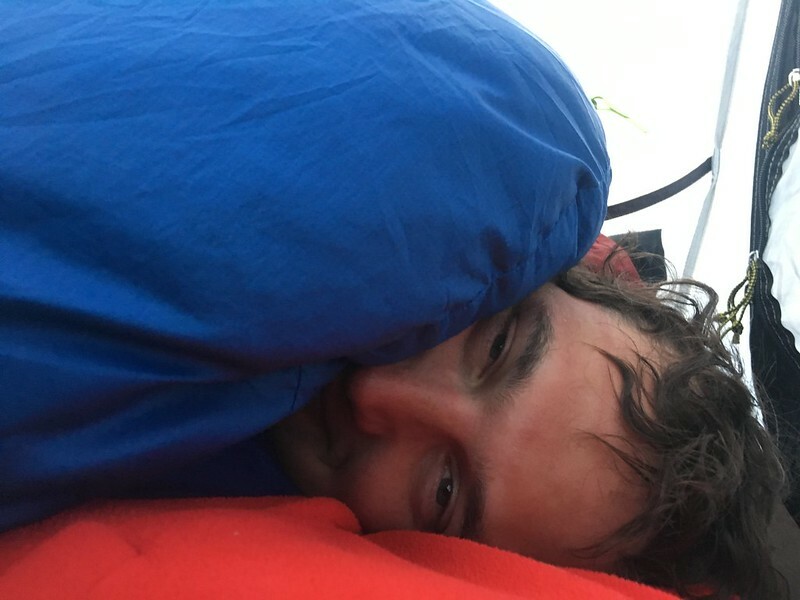 A couple flasks were downed and the three of us retreated to the tent to rest up for summit day. We continued up the cleaver Sunday morning at 5 and by 7 the sun was hitting most of the route. This proved to be a big problem; around 12,000 feet we started getting hit by ice pellets, which turned to ice balls, which turned to rock, one of which flew right over my head. Good karma? Bad karma? Damnit. The reality had sunk in. Our timing was off, conditions weren’t right. The good news was we were nearing the top of the couloir. 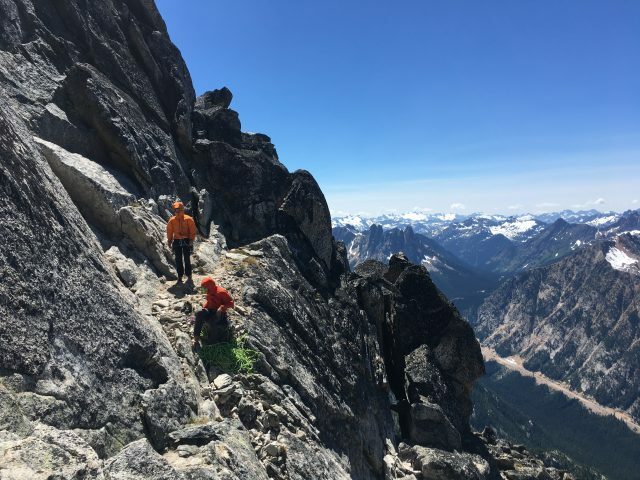 The bad news was if we wanted to summit, we still had an exposed traverse over the Kautz underneath a rimy, rocky, ridge that was also likely unloading its contents onto the slopes below. A fall would be “a bummer” in the words of David Kiker. Agreed, David. We made the safe call to fold our hand on the summit bid and focus on the ski/board down. After a quick nap at 12,800 feet, we headed down. Snow was firm up high, with some packed powder turns, turning to corned snow between 12,000 and 9,000. 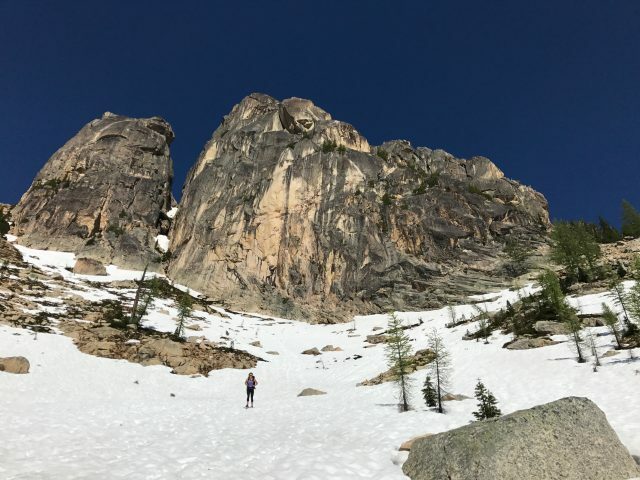 We did not observe any loose wet avalanches on the way down, although the snow got very rotten around 7,000 as we descended via the Van Trump, down through comet falls and eventually onto the hikers trail. This is a fun tour that is highly recommended over two days; great steep skiing and an isolated feeling. Tagged Mt. 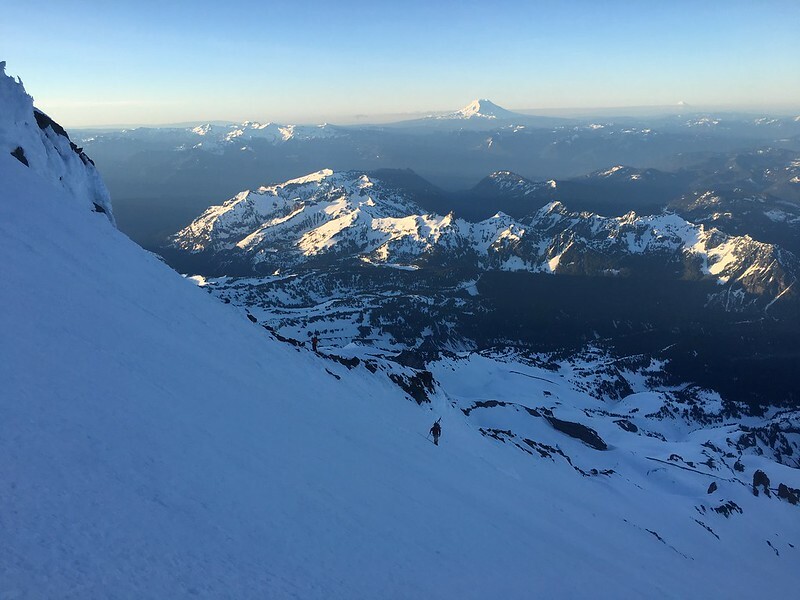 Rainier, Success Couloir, Kautz Cleaver, Spliboarding.